Recently my stepdaughter has developed a fondness for roasted potatoes. She is a super picky eater, so whenever she begins to like something new, I celebrate. The roasted potato concept is super simple– cut small potatoes into wedges, toss them with olive oil and spices, and roast them on a baking sheet. In the past I’ve used rosemary, oregano and other herbs to give the potatoes flavor. Last week I tried using smoked paprika and fresh garlic with awesome results. The potatoes turned out sweet, salty, and smoky. Totally delish. It’s a quick and easy recipe, perfect for a weeknight side dish or Sunday brunch. It’s also vegan and gluten free. Score! If you can’t find smoked paprika, this recipe will also work well with regular paprika (not cayenne, which is really spicy– though you can add a dash of cayenne to the mix for a bit of a kick). 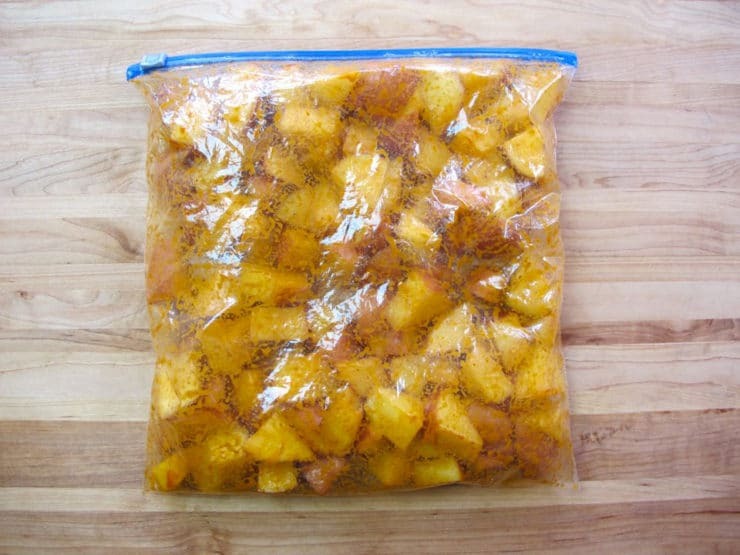 I like using a Ziploc to toss the potatoes, it makes for even dispersion of the spices and easy cleanup. Enjoy! 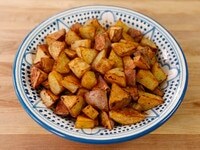 Recipe for Smoked Paprika Roasted Potatoes - easy oven roasting method with olive oil, garlic and spices. 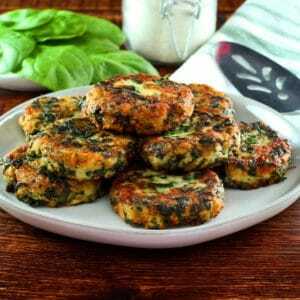 Healthy, vegan, gluten free side dish. Preheat oven to 450 degrees F. Scrub the potatoes clean, do not peel. Slice into 1- to 1 1/2-inch wedges. 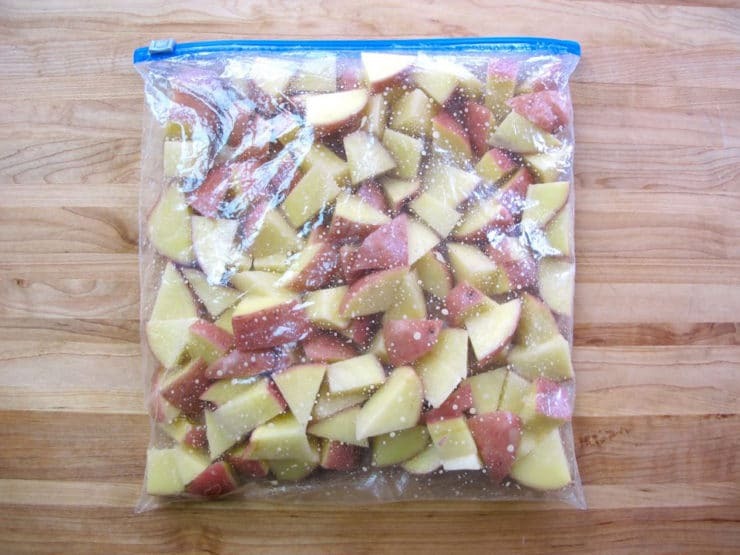 Place the wedges into a gallon-sized plastic zipper bag with olive oil. Close the bag and toss the potatoes well. Work the potato wedges with your fingers for a minute or two so that all the potato pieces are lightly coated with oil. Open the bag and sprinkle in the spices and garlic. Close the bag again. Shake the bag and massage the potato wedges again for a minute or two so that all the pieces are evenly coated with seasoning. Spray a baking sheet with nonstick cooking oil spray, or lightly brush with more olive oil. 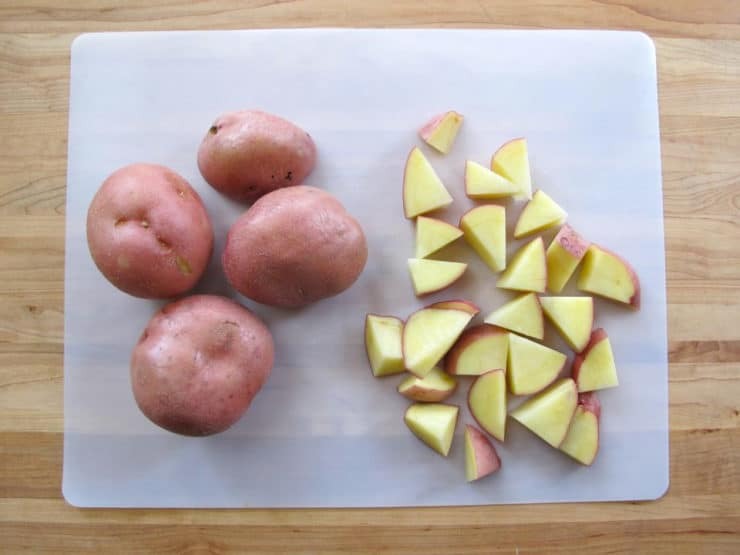 Spread the potatoes out in an even layer onto the sheet, making sure that the flat surfaces touch the sheet. This will help the potatoes get crisp. 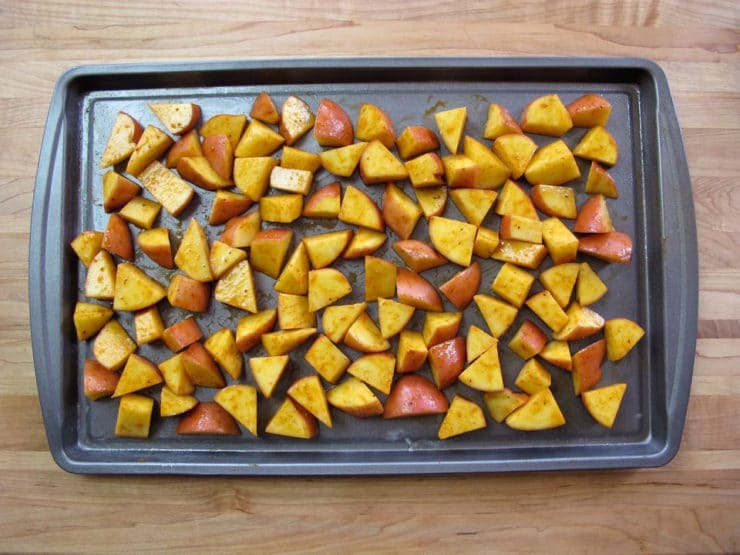 Place the baking sheet into the oven and let the potatoes roast for about 25 minutes, stirring once halfway through cooking, till the wedges are cooked through. They should be crisp on the outside, fluffy and soft inside. Season with additional salt to taste, if desired. Serve hot. Note: these potatoes are kosher for Passover. If you look for a KFP hechsher on your Passover ingredients, you may want to substitute regular paprika for the smoked. I'm not sure if there is a Passover-certified smoked paprika on the market yet, but a certified regular (sweet) paprika should not be hard to find. I tried and loved it. A unique twist on a basic dinner side dish. I made this recipe last night using Yukon Gold Potatoes and they came out great. So simple, but so good. Even the picky teenager enjoyed them. Thanks! Is there a specific reason you are using red potatoes? Will this work with gold potatoes? Gold potatoes will work great! Tried this and happy tummy ‘a all round!! Thanks for a fab recipe. Is there any way this can be cooked ahead of time, then warmed and served? I’m leading the Seder and I can’t worry about cooking (other than warming) during the Seder. Great recipe! Cooked this twice now and both times been a winner! I served it with a warm spicy chicken salad, delicious! I love smoked paprika and baby gold potatoes and only using one roasting dish, so of course I make them as a roasted combo dish. I do add onions (lightly browned via roasting in the oven before tossing with some added raw minced garlic on top of the potatoes (after tossing some salt, pepper and a sprinkling of Herbes de Provence over the potatoes first). I made these potatoes and added your vegetable recipe to it. I used butternut squash and sweet potatoes along with Idaho potatoes for a side dish. Wow. My husband says it’s a keeper. Thanks. this is a great, tasty potato recipe. my take is”use very small poatoes, cut a thin slice from bottoms. now they sit up straight. using a melon baller, create holes that you may fill with sour cream. top with smoked salmon and/caviar. I have a version of this which includes frying the potatoes first in all the same spices (add cayenne) then put into a deep baking dish and add in a can of chopped tomatoes. Cover and cook for 45 mins, uncover and cook for further 10 minutes until the potatoes go golden and crispy on top..it is delicious..
yum! 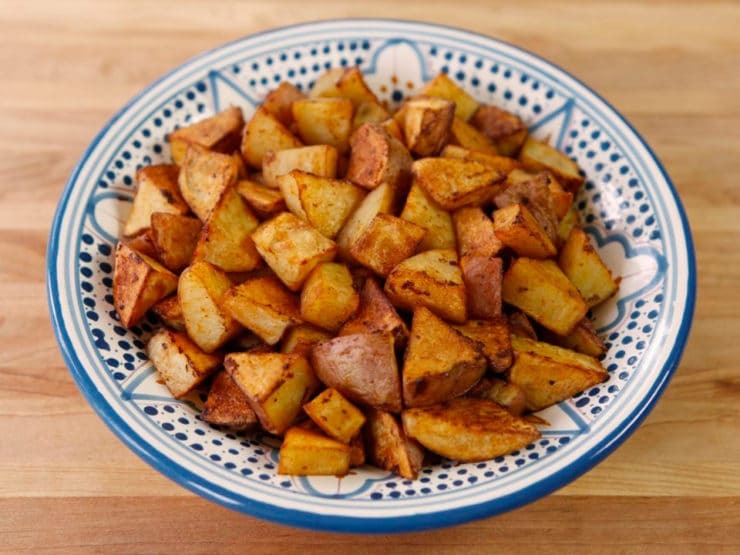 definitely making this – roasted potatoes are a fave but i’ve never done them with smoked paprika. thanks for the idea! 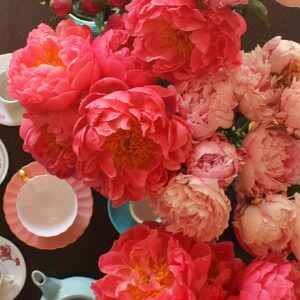 I’m new to the blog and am enjoying it! The recipes are great!! I have purchased different types of smoked paprika–sweet, hot and medium hot, and find that most times recipes don’t specify which type to use. Which one did you use in this recipe? Do you use any of the other types? If so, what do you use them for? Hi Linda, I’ve never seen different heat levels for the smoked paprika, but for this recipe I would use sweet. Enjoy! Linda, I love hot but my wife is a bit more toward sweet. I took the 1 1/4 tsp and made it 1 tsp sweet and 1/4 tsp hot… PERFECT! We both enjoy it! Win-win!!! I really like your idea. I kept thinking of spinach or chard, but didn’t seem that exciting without some sort of cheese. Gonna practice with your idea, I’ll let you know how it goes. Thanks! Simple but sure adds a nice smoky twist to potatoes. Say Tori, I am changing our chicken dish for Passover this year. I want to make chicken paillards, rolled, stuffed, and baked in the oven. I am looking for a stuffing, got any ideas? We cook for 32 people so it can’t be too complicated. Also serving our tomato brisket. Tori, This sounds like an excellent recipe. I will have to try it soon, though reducing salt as I am not supposed to use very much. With regard to the question about calories: calorie counts for freh fruits and vegetables are the same for the same sizes, and for things such as olive oil they are the same across brand names. Hi Dr. Mike– that’s true, but if I included a calorie count I would do it across the board on all recipes. If I only do it on a few, then readers will come to expect it on every recipe, and right now the existing calorie counting technology is too unreliable to support it. I do have it in mind for the future as a possible feature to add on at some point. 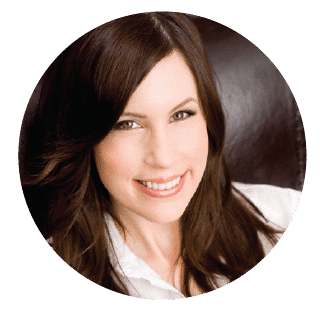 Hi Kristen, I don’t offer calorie breakdowns on my recipes. The nutrition calculators available online are not always reliable, and nutrition stats of various ingredients can vary from brand to brand (sodium content, calories, etc.). There are calorie calculators online you can use where you can plug in the specific brands you use. Just Google “calorie calculator” and you should get many results.